A baby named Tseriletso arrived at the safe-home today and it just happens that I am neck-deep in statistics working on a grant proposal. Because of this, I noticed that Tseriletso is the 30th child we have had in the safe-home during the six-months Bridget and I have been in Lesotho. Looking back through the names I am hit with waves of nostalgia; intense happiness for some of the children, and deep sadness for others. The children that find their way to TTL are some of the most vulnerable children in a wholly vulnerable country, so their stories often follow dramatic arcs. The names Thoriso and Retselisitsoe bring me back to when we first arrived. They are both back with their families now, and thriving in their homes. More than anything else, I miss them as playmates. 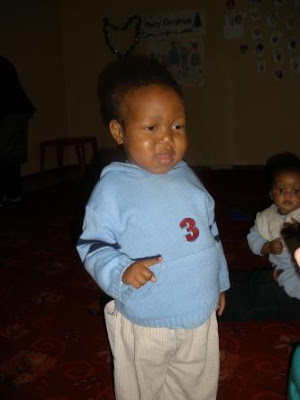 Lerato reminds me of our first months here as well, but his name also elicits a kernel of concern in my heart. Lerato continues to struggle despite returning to a doting mother, held hostage to the all-too-common combination of chronic malnutrition, TB, and HIV. He seems destined to struggle no matter how much help we give him and how much love we can shower on him. Mokete and Relebohile occupy the largest portion of my memories. They both arrived in the first few weeks we were here and both left recently. We watched their journeys from start to finish: from death’s door to relative health. Thinking of them causes me to whelm up with pride for the work TTL is doing. And then there are Thato and Reitumetse, who didn’t make it. It is hard to utter their names without rehashing their last days, second-guessing, and cursing. 30 kids and 30 unique stories, and now there is Tseriletso, whose story waits to be told. Nice post, Bridget. Looking forward to meeting our new friend.